Save up to 4%, why not try? 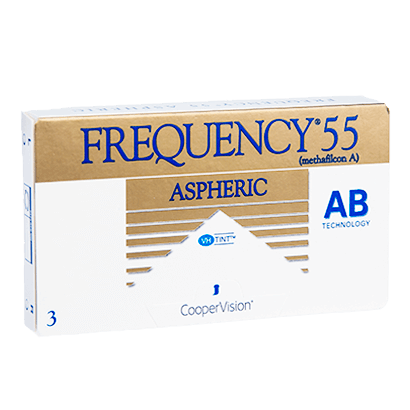 Designed to deliver visual clarity in different light conditions, Frequency 55 Aspheric contact lenses are some of the most popular monthly contact lenses around. These impressive lenses have been created by eye care experts CooperVision with Enhanced Resolution Technology. This ensures they can offer clear vision and exceptional visual depth for all wearers, including those with more extreme prescriptions. 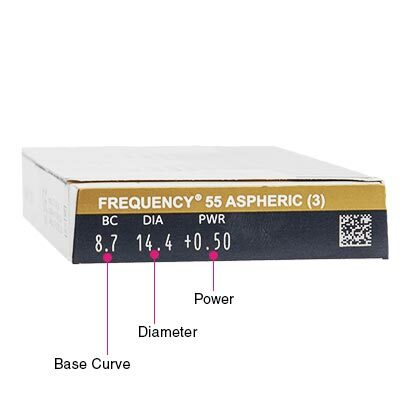 With an aspheric shape and UltraSync design, Frequency 55 Aspheric contacts maintain their position on your eyes as you move your eyes and head, delivering clear and crisp vision, uninterrupted by halos, blurring or glares. 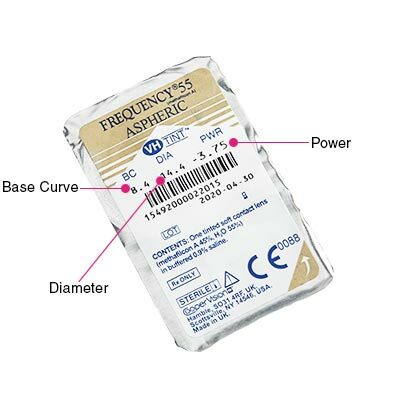 Frequency 55 Aspheric contact lenses are the perfect choice for a busy lifestyle, or those used to late nights, early starts or both, as they can be worn for long periods of time. Comfort is upheld throughout wear. We recommend cleaning and storing them in comfi All-in-One contact lens solution every night to maintain their quality. Enjoy comfort, hygiene and clear vision for the entire month with Frequency contact lenses. Available at a highly accessible price already, our Price Match Guarantee means we can make sure you're getting the lowest UK price possible when you buy contact lenses cheaper online at FeelGoodContacts.com. comfi Air can be worn as a silicone hydrogel upgrade to these lenses. Cheap and does the job. Yay for aspheric lenses! I ordered these along with dailies in a similar prescription. Since lasik I have had difficulty seeing in low light conditions add to this the "benefits" of aging that now require me to have my vision corrected and you have a recipe for frustration. Well,problem solved, I can see again. My expectations have been exceeded. 5 stars because my order came with gummy candy! Great product and priced extremely well. 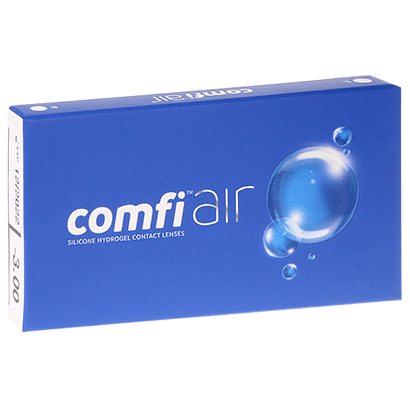 Great comfortable contacts, fantastic value and fast delivery! Very pleased with these lenses,the comfort and fit are really good I can''t tell I have them in. Used these lenses for years. They're great! Great value for money, comfortable fit and easy to wear. Always arrive in time stated. Only just started using contacts and these are better than the first ones i was given on my free trial by specsavers. no problems at all with them. Excellent prompt postage. Product up to its very high standard. Have used for a while now and find them so comfortable. Great contact lenses. Have been using them for years. Delivered in no time. Outstanding quality. Would recommend to anyone!! Very affordable contact lenses..fast delivery and a free pack of Haribos. This is the second time I have ordered from them and will continue to do In the future. Comfortable to wear - Great value for money! Really excellent service and quick delivery I would definitely recommend to other customers. Price was also very competitive and also was given five percent off my next delivery of contact lenses. Sometimes I leave my purchase very late, until I am down to my last lens but I know that I can order & receive my lens the next day. Feel Good give excellent service & prompt. Perfect and cheap! Would recommend and buy again. Good product and very fast service even over Christmas period. Perfect super comfortable all day no issues. Moisture level is good. I received my lenses the next day, a very efficient service & I will continue to use you. I love the little pack of Haribo sweets?? Good quality, delivered quickly, at a very affordable price!! Ordered these lenses previously. Excellent quality. When I used to get them from the Optician far more expensive. great and confy! always comes very fast post. will always buy these are theyre cheap! I am pleased with this product but could change to a brand of contact lens with a higher water content so I can ware them for longer! Tried these lenses as they were cheaper than my usual ones, didn''t like them, vision was blurred after about 8 hours of wearing them, will be returning to my usual brand in future. I really was not expecting much as I have an astigmatism but I can not tell you how amazing these are. I have only had leading brands and these are light weight and easy to use. Converted. Very good value and a trusted brand. Good value and great product. the best contacts lenses I''ve wore in the last 15 years. I found them last year and since then I always buy this product / type. I really like these lenses, I had never tried them before. They are very comfortable to wear, even for a twelve hour shift in a air conditioned environment. I''ll be purchasing them again. I''ve been using these lenses for a while and I''ve never had any problem. Comfortable monthly lenses, not expensive. Reasonably priced. Comfortable. Very happy.